Welcome to Vancouver. You are visiting one of the greatest cities in the world: eye-popping scenery, efficient services, moderate climate, relaxed and diverse population. But one legacy that isn’t so enjoyable is the thousands of homeless people on the streets of Vancouver. You can’t help seeing them as you walk around downtown, and in many other neighbourhoods around the city. This is shameful situation; visitors in 2010 are being treated to a city with almost as many homeless people as athletes competing in the Games! We organized new games that reflect the unique local flavour of the 2010 host city — the Poverty Olympics. 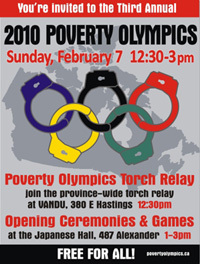 The first annual games took place on Sunday February 3, 2008, in the Downtown Eastside (Vancouver’s poorest neighbourhood). Read about the 3rd annual games that took place on February 7, 2010 on our blog. We are so proud of these games that we asked the International Olympic Committee to make these games part of the official 2010 program. The fact that they didn’t did not deter the 600 Poverty Olympics fans from attending! We hope that shining the international spotlight on the dark side of our prosperous city and province might finally convince our governments to take action. We hope, dear visitor, that you’ll take a few minutes to look around… Learn more about the poverty amid plenty… Help us make change by taking some simple actions… And don’t forget to invite your friends to visit our fair city! • Homelessness: doubled in Greater Vancouver between 2002 and 2005 alone — there are now more than 2,000 people living on the streets or in shelters. Hundreds search through the garbage for food and things to sell every day. • Welfare: It’s supposed to provide a minimum amount of money for basic necessities when people go through a hard time. But our provincial government made it even harder to get, and the rates are less than half the poverty line (not enough to rent a place to live and eat nutritious food). • Disease: Vancouver’s poorest neighbourhood, the Downtown Eastside, has an HIV rate of 30% — the same as Botswana’s. Other diseases like Hepatitis C are rampant. • A Gold Medal for Highest Poverty Rate: British Columbia (our province) is a gold medalist when it comes to poverty — we’ve had the highest child poverty rate in all of Canada six years in a row. • Solutions: It’s not too late to make a difference before 2010. Our governments need to invest more in things like a decent welfare program and social housing… For a fraction of what it costs to deal with disease, malnutrition, addiction, and disorder.